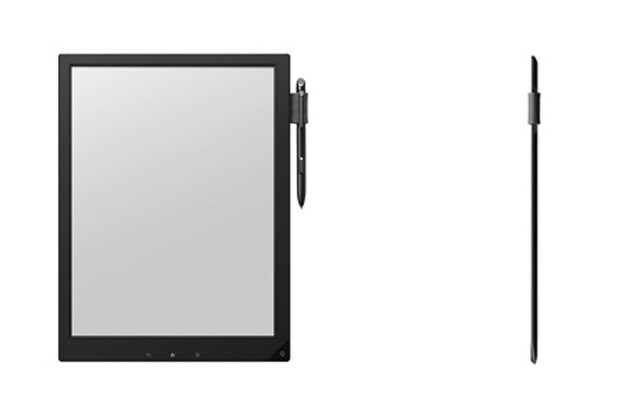 Sony are working to offer students an e-ink note-making tablet: We want one! Sony might be having a hard time in the tech world at the moment, but that doesn't mean that things behind the scenes are slowing down. Indeed, Sony appear to be trying to revolutionise the way we take notes and read. As you can see in the image above, which is a prototype set to be tested at universities in Japan before the end of the year, Sony are trying to bring those boring bits of A4 paper to life! That's why they're working on this 13.3" 1600 x 1200p e-Ink tablet which will hopefully help reduce the amount of paper which we consume. The device is designed to be the same size as A4 paper and the display has an electromagnetic induction touchscreen, which is basically a fancy way of saying that it is a touchscreen and there's also stylus compatibility so this thing could genuinely be a great studying tool! At the moment the device only has support for PDF files which is a shame, but we do have to remember that this is a prototype so if and when this is launched it would probably have support for a few other file types and hopefully there'll be a browser too! At the moment the prototype is nice and slim at 6.8mm (0.27 inch) thick and weighs 385g (13.6 ounces) which should fit in any reasonably sized bag! On-board storage comes in at 4GB, which is MicroSD expandable if you're a serial note taker and Sony plans to give this device Wifi capabilities so you can share your notes relatively easily. At the moment this thing is expected to last about three weeks of usage if you keep Wifi off and just write and go over your notes, which isn't too shabby at all. We can expect a few changes after the field trials, but it's just a shame we couldn't have had one of these things for our studies! We're a tad jealous!